Would you like to have a strong and beautiful smile with no gaps? Of course, your answer is yes because you would like to avoid the many consequences of missing teeth. Here’s some great hope: you could qualify for dental implants from your cosmetic dentist in Jacksonville, Dr. Larry Young. Today’s dental implant is the most reliable and beneficial dental prosthetic available. In fact, it’s the next best thing to a real tooth. It can correct your smile structure and appearance, too. Dentists have been replacing missing teeth for hundreds of years. Your complete set of teeth helps you to smile, eat, and speak. Also, research from the American Academy of Cosmetic Dentistry says that an attractive smile is the very first physical feature people notice about someone they’ve first met. So, your teeth truly portray who you are and what others think about you. Tooth loss, however, damages self-esteem, nutrition, speech and the size and strength of your gums and jaw bone. Also, smile gaps make your facial muscles sag, giving you a prematurely aged appearance. Unlike traditional crowns and bridgework and partial and full dentures, dental implants look, feel and act like real teeth. 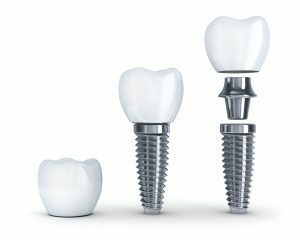 Because of a natural process called osseointegration, the titanium dental implant readily bonds to the jaw bone after an oral surgeon places the device during a simple in-office procedure. As such, implant patients enjoy stable oral function and great smile aesthetics, too. Made up of three parts–the implant screw, a metal post, and a lifelike porcelain crown– the dental implant resides right in the jaw. After the in-office placement surgery, the dental implant site heals, strengthens and allows for placement of the post and crown. Multiple implants may support bridgework and full and partial dentures. The American Academy of Implant Dentistry reports that the dental implant is probably the last tooth replacement an individual will ever require. Unlike bridges and dentures which last only seven to ten years, dental implants last for decades–or a lifetime if you’re 45 or older– with good at-home hygiene and in-office dental care. While they are more costly at the outset, implants avoid repeated replacement costs and the many smile problems associated with missing teeth. Do You Qualify for a Dental Implant? Problems such as tooth decay, gum disease, and a thin jaw bone may be corrected so a patient can receive an implant. Regarding tobacco, Dr. Young urges his patients to stop smoking. However, he will place implants if patients have healthy teeth and gums and refrain from smoking 72 hours before and after the oral surgery. Smoking contributes to a destructive condition called peri-implantitis. This infection resembles advanced gum disease and threatens implant retention. While other factors, such as poor diet and oral hygiene cause peri-implantitis, tobacco is a major contributor. If you desire a strong and complete smile, find out if you qualify for implants.Contact Larry Young Dental today for a restorative dentistry consultation.